"An easy-to-make crowd-pleaser. The truffle oil gives the dish an exotic flavor. I use white truffle oil, but black is probably good, too." Bring a large pot of water to a boil; add sweet potatoes and cook until tender, about 15 minutes. 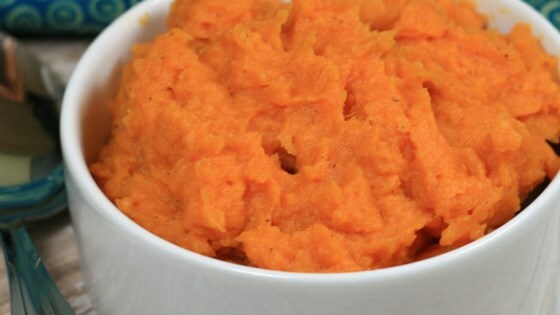 Drain water and return sweet potatoes to pot; mash until smooth. Stir butter, chicken bouillon granules, black pepper, truffle oil, and garlic powder into mashed sweet potatoes until smooth. These were fantastic. As other reviewers mentioned, 1 tablespoon of black pepper seemed like too much so I only added about a teaspoon. Too much pepper . And I like pepper.